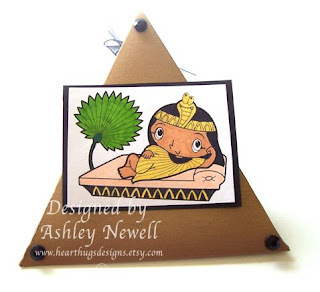 AshleyNewell.me: Pez-A-Doodle New Release BLOG HOP! Pez-A-Doodle New Release BLOG HOP! If you just stumbled across my blog today, you'll want to go back to Catherine's blog to start the Pez-A-Doodle new release blog hop! Woohoo! I've been waiting for this day for a while. I really love this image AND that fact that it's going to be the first in a whole new line from Pez-A-Doodle! FOR THREE DAYS only, Princess Cleo will be available for purchase as a digi before her rubber release on April 22! So, hurry and get to Pez-A-Doodle before she's gone! The BEST thing about the digis is that you can make them as big or small as you need. That and you just store it on your computer so it takes up no space in your stamp room! I made a triangle treat box for my sample. I thought this princess needed her own pyramid! I think this would be SO cute as a little favor for a birthday party. You could put candy or toys inside. I colored Princess Cleo's outfit in sparkly gold gel pen, so she just shines. The triangle box is made out of metallic gold paper, super fun! Ok, so to continue the blog hop, you just go on over to Marti's blog (our fearless leader!) Have a great day everyone! This is super. I love that she has her own pyramid! Great job! OMGosh I just love this card and how you did a pyramid. You are one creative and inspiring stamper. So cute Ashley! Awesome job! Oh how cool using the triangle box! Great job! What a great idea to give her her own pyramid! I love what you've done with her. Oh gosh how cute is that Cleo???!!! I love that treat box....so creative with your Cleo!!! You are doing a great job on your DT Sneak Peeks girly!! Coloring is great!!! I am enjoying crusing your blog!!!! So cute! I love your project and the image is adorable!